Plot summary : The dating simulation game for female players (otome game) is set during Japan's Taishō era (1912-1926). A girl named Haru Asagi works as a maid of the Miyanomori family, which is headed by one of Japan's most powerful magnates. However, the family head suddenly announces that he is retiring, so one of his six sons must assume control of the family. 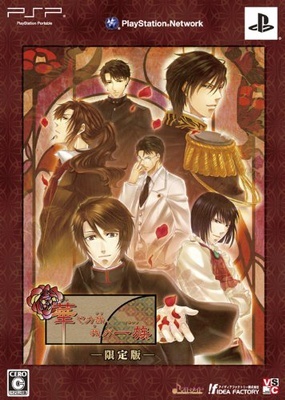 Note : Idea Factory's Otomate brand released the game for the PSP system in 2010, and the game inspired a fan disc, Hanayaka Nari, Waga Ichizoku: Kinema Mosaic, last September. I will protect you from the darkness and I change my destiny. Oh my, an anime series for this? Wonderful! I feel like you have played the game beforehand. Probably late but official anime website is up. It's going to be an OVA. I heard rumors that that there will be 2 with the first one to be released this year. The site only has the staff and cast list only. No other info so far. I'll just list down the cast for the Miyanomori brothers. I don't know who the main heroine's voice actress yet. Probably they're still looking for someone decent. Release dates for the 2 OVAs are announced in the official anime site. BTW, they already put up the character designs. Still, no announcement on who will voice the heroine. Was kinda wondering the same thing tbh. A bit late but PV is out in youtube. The video quality looks bad but you can view a better version in the official site. The animation looks okay, though. 1st OVA was also aired on AT-X 5 days ago (2nd December 2012) and there will be a repeat airing tomorrow. It is about 1 hour long (50 minutes and 59 seconds to be exact). I can't find any info yet whether 2nd OVA will also going to be aired on TV or DVD only episode though. By the way, anyone know if there are a group going to sub this series? Hello, here are subs I did for a friend. Note: This is a V2 script. Some errors have been fixed. The raw episode used to time and preview the subs can be found here. Not bad chirlwind ... tyvm. Looks like the 2nd episode was also aired on AT-X yesterday at 21:00 JST and there will be a re-airing (for those who missed it) on the 9th of this month at the same hour. The DVD release date for the 2nd episode is changed from 3/14/2013 to 3/29/2013.